The key ingredient in this recipe is coconut cream. I know some of you must be wondering what the difference is between coconut milk and coconut cream. When you crack open a mature coconut, it usually contains some clear water, which is generally discarded, and the white flesh, which is called coconut flesh, coconut meat or fresh copra. The coconut meat is finely shredded and boiled with water to give coconut milk or cream depending on the ratio of water to shredded coconut, which also affects the fat content. Coconut milk is made by simmering one part shredded coconut meat and in one part water and generally has a liquid consistency, more like half and half or table cream (18% cream). Coconut cream is thicker and more paste like in consistency and is made by simmering 4 parts shredded coconut in one part water. The fat content in coconut cream is 24% and in coconut milk is 17%. If you cannot find coconut cream, you can buy a can of coconut milk, open it without shaking and extract the thick liquid floating at the top, which is generally the coconut cream. The water usually settles at the bottom. Discard it. 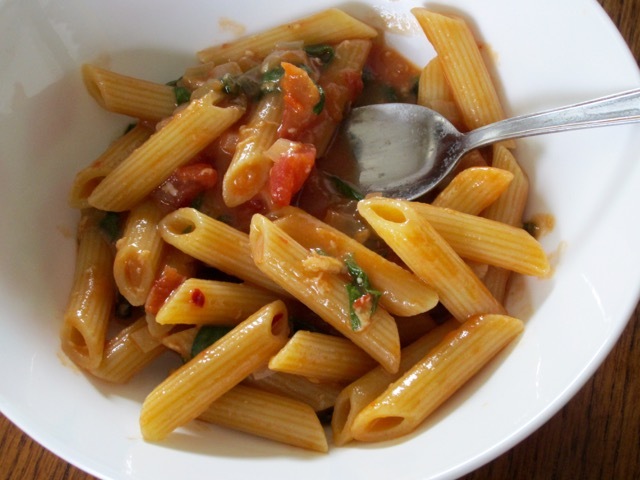 The pasta tasted very nice and I hope you’ll love it too! 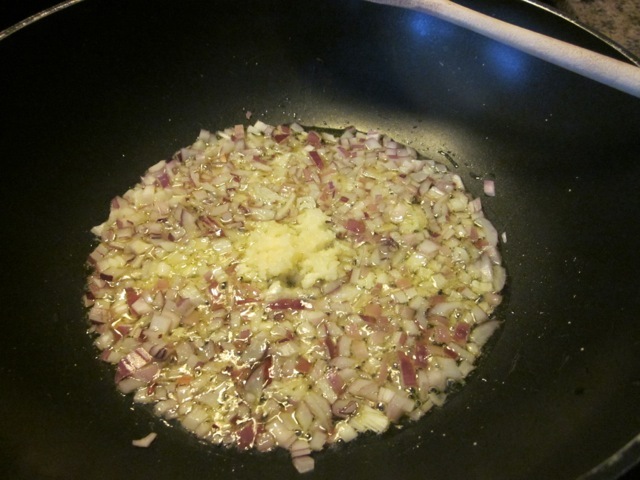 Heat oil in a pan over medium low heat and gently sauté onions and garlic. Do not brown. 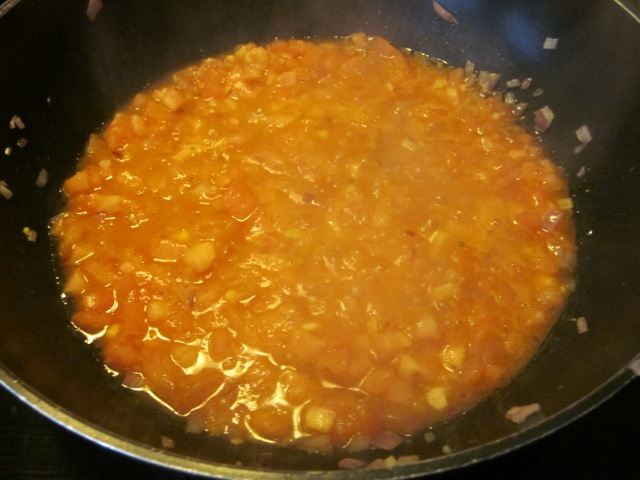 Add chopped tomatoes, bring to the boil and simmer 10 minutes. (You can add a bouillon cube or powder if you like). Meanwhile boil the pasta in plenty of salted water as per packet instructions until almost al dente and, drain thoroughly. 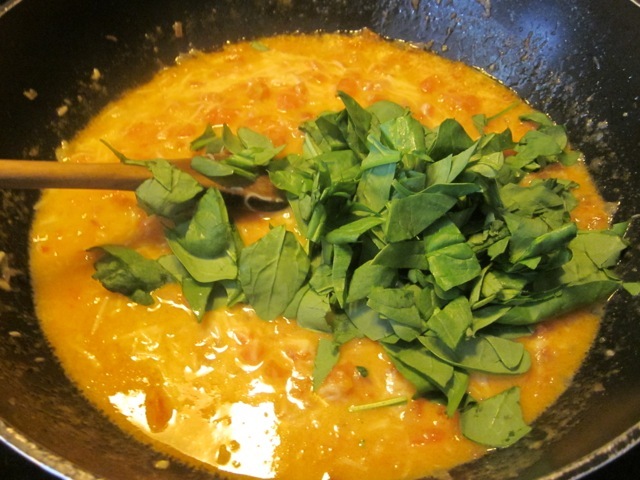 Stir in coconut cream, Parmesan and baby spinach and stir gently over low heat until melted and spinach is wilted. Season to taste. 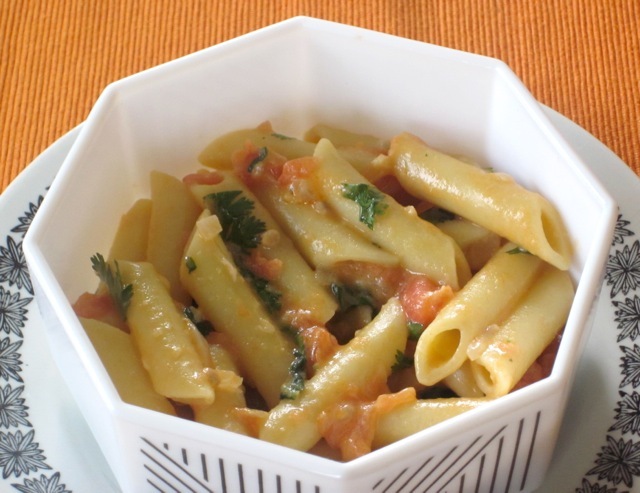 Toss in pasta and fresh herbs and mix thoroughly. Serve hot. I just made this for lunch (8 February 2018) loved the photo so I added it here. Have a pleasant day! Meanwhile boil the pasta in plenty of salted water as per packet instructions until almost al dente and, drain thoroughly. Stir in the coconut cream, Parmesan and baby spinach and stir gently over low heat until the cheese is melted and spinach is wilted. Season to taste. 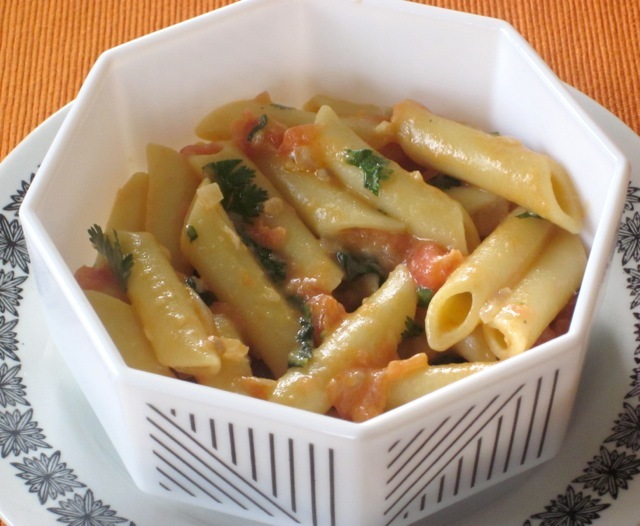 Toss in pasta and fresh herbs, and mix thoroughly. Serve hot. If you prefer more sauce use more tomatoes and more coconut cream. 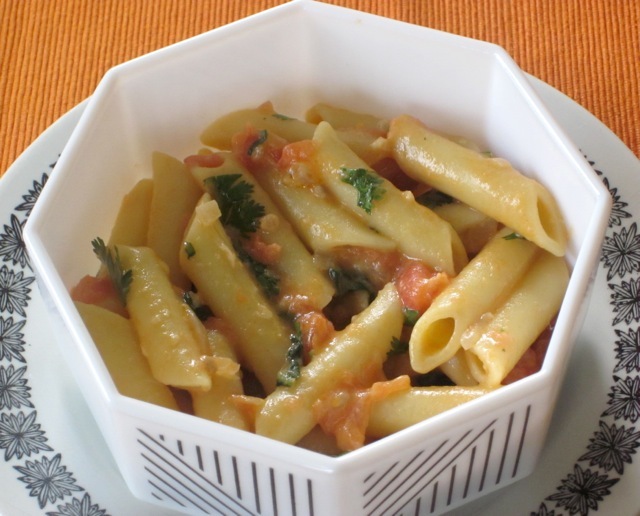 I prefer fresh juicy tomatoes like hot-house for this recipe! 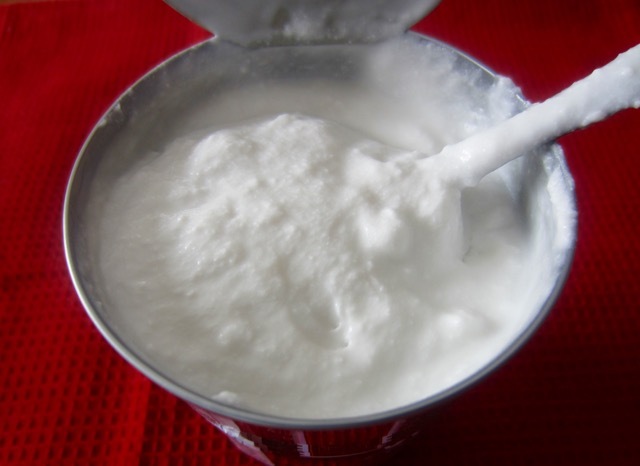 If you cannot find coconut cream, you can buy a can of coconut milk, open it without shaking and extract the thick liquid floating at the top, which is generally the coconut cream. The water usually settles at the bottom. Discard it. Liz I wish I had seen this before I made the coconut cupcakes…. it would have been another item I could have made to share the flavor of coconut with my son. I hope to be here more often now that I have a computer that works again… missed your blog ! Thanks. Happy New year and glad to hear that your computer works again. I love coconut milk!!! Wish you a pleasant weekend! I have had a glimpse. I shall definitely try it sometime. 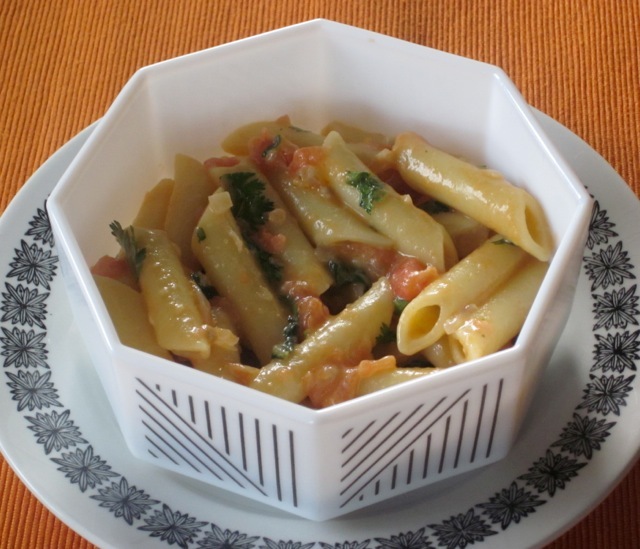 do you know: I have NEVER made regular pasta with coconut sauce. But now looking at this I cannot wait to experiment! There is always a first time so I hope you’ll make it a point to experiment. I wish you a happy cooking and the best of the weekend! Thanks, for complimenting. I hope you’re enjoying your weekend! It looks good. I’d never thought of pasta in coconut milk/cream before. I always associate that ingredient with Thai food. Have you heard about coconut oil and it’s health benefits? I wonder if it’s worth switching. Ha ha Lignum. Coconut is great because it’s a lactose free substitute to milk. When I see coconut, I see all foods. How have you been? Boy It’s taken long to respond but here I am. Wish you a good week! Did you try it? I hope you liked it. Best wishes! Yum yum and yum! You are speaking my language, coconut and tomato! The coconut language, so delicious. I love it too! Sure looks delicious!Recipe well explained! Thank you. Enjoy the week! It’s great and lactose free. Have a fabulous week! Thank you, Dana. I hope your week is great!